With approximately 9 weeks to go till little Abigail is born I’m definitely in full-blown nesting mode now. I have been for a while but now I feel as though it’s “kicked-up”. I painted a Bible verse on her wall with a couple of butterflies and am organizing everything in the house like a mad woman. I planned out all our meals for the rest of the month and even included things like get-togethers for the church picnic and small group stuff. I am finding deals on everything possible with groceries and diapers/wipes also. Next month I plan to start my freezer cooking for meals that will be for after Abigail is born so I won’t have to worry cause I don’t know what life will be like and we will really need to not be spending a lot of money. But it’s all pretty fun. I just feel extremely productive and no matter how much cleaning I do it seems to be never-ending. I also have showers coming up this month and it’s going to be CRAZY…but really fun. I’m busy every weekend and I can’t wait to see what Abigail gets. 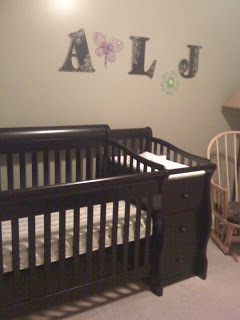 Plus I will get to organize it in her room! I am praying we get all the necessary items cause baby stuff is expensive! I’m also excited because I’ve been praying a lot for Kyle’s business (J2 Marketing) to continue growing and it’s doing just that. He got called about a really good marketing job and website for a church plant in Indy and it’s going great. He’s also doing a proposal with people that made up a new invention and want marketing/website to make it a successful business. I am praying that God will give him wisdom and direction with each thing that comes to help them be as successful as possible. It’s exciting to see my husband prosper and fulfill his dreams! Praise the Lord!